Peter Bryer: Mobile Foresight: Death by a thousand cuts. The European mobile crisis deepens with Sony Mobile's departure. Death by a thousand cuts. The European mobile crisis deepens with Sony Mobile's departure. Not a great start for the end of summer: last week Sony announced that it would be cutting 1000 jobs from its Sony Mobile unit and moving Sony Mobile's headquarters from Lund, Sweden to Tokyo. While Sony Mobile will continue to have a large presence in Lund, this downward spiral is making a large sucking sound. This is certainly sad news for the many who will be losing their jobs. And very sad news for the continent that was once the center of the mobile world. There was a time when most key mobile developments such as standardization, design, and even advanced manufacturing took place in Europe first. Companies such as Nokia, Ericsson, Siemens, Alcatel, and Philips led the way. But like the Ten Little Indians, these leaders disappeared one by one along the way. Some were careless, some were unlucky. But in the end, they were all gone. The "East-West" trend continuing. Most hardware development has gone East. Most software and services development has gone West. And in the middle, nothing but a big, ugly hole in the ground remains. This gap will hurt for years to come. The mobile business is still a baby in many ways, and the European economies stand to lose out in the coming decades. The real advancements the industry has been talking about for the past 10 years is only starting to materialize now. There's NFC and mobile payment. There's mobile healthcare and well-being. There are exceptions and there is hope. Ericsson and Nokia Siemens are still top players in the mobile infrastructure market. Spotify and Skype (now owned by Microsoft) are great examples of top services coming out of Europe. And there are many small, interesting startups. The good news is that shifts happen both ways and there is plenty of room for everybody. There are large pools of mobile talent in many European hotspots, and many innovative mind. European leaders would be wise to get mobile again, or risk simply watching the game from the stands. 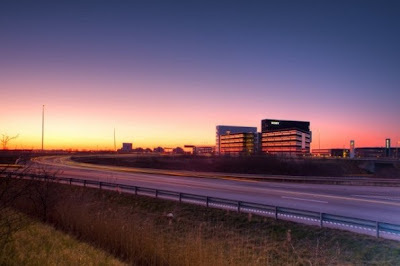 Sony Mobile's current HQ in Lund, Sweden. Is the sun setting on mobile Europe?